The iconic marathon around the picturesque Lake Rotorua takes place every year. Competitors that ‘take on the lake’ will start at the Government Gardens and head out through the city, around the back of the lake over the Hamurana hills and wind their way back towards Rotorua. Competitors then run and walk under the historic Prince’s Gate Archway up the finish straight and into the Rotorua Energy Events Centre. All entrants will receive an official Asics souvenir event T-shirt, a race bag jam packed with goodies from sponsors and a finishers medal. Minimum age to enter this event is 16 years of age. 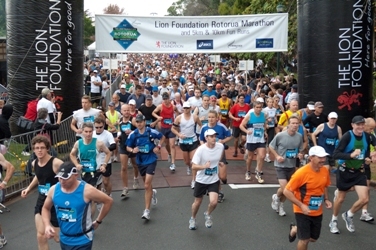 There are other marathons also in Rotorua apart from famous Rotorua Marathon. All competitors will be shuttled from the Energy Events Centre around the back of the lake to the half way point of the marathon at Marama Point. Competitors run and walk their way back into Rotorua following the same course as the Marathon, finishing up through the Prince’s Gate Archway and into the Rotorua Energy Events Centre. All entrants will receive an official Asics souvenir event T-shirt, a race bag jam packed with goodies from sponsors and a shuttle ticket to the start line. Minimum age to enter this event is 13 years of age. 10km and 5km competitors will wind their way through the famous ‘Sulphur flats’ and return back along the same route as the marathon. They get to experience of the Rotorua Marathon finish; through the Prince’s Gate archway and into the Rotorua Energy Events Centre. All entrants receive race bag jam packed with goodies from sponsors. Minimum age to enter these events is 10 years of age.